Thousands of baseball fans provided a captive audience for the latest End Polio Now public service announcement during the 6 August baseball game between the Philadelphia Phillies and Florida Marlins. The big-screen presentation was part of Strike Out Hunger night, sponsored by Rotary districts 7500 and 7640 (New Jersey, USA), an annual event involving more than 200 clubs from five districts in Pennsylvania, New Jersey, and Delaware. 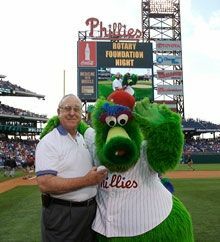 Rotary Foundation Trustee John Germ threw out the ceremonial first pitch and took part in pregame publicity for Rotary. Germ also chairs Rotary's US$100 Million Challenge Committee, which oversees RI's effort to match the $100 million grant for polio eradication awarded by the Bill & Melinda Gates Foundation. Strike Out Hunger night is the brainchild of the late Neil Garber, who served as district governor for districts 7500 and 7640. Every year, the districts work with the Philadelphia Phillies to reserve a block of tickets. The districts receive back a portion of the ticket sales, which they in turn donate to The Rotary Foundation. This year, the funds were earmarked for Rotary's US$100 Million Challenge, which supports RI's PolioPlus program. Event coordinator Marvin Axler, a member of the Rotary Club of Garden State of Cherry Hill, New Jersey, said about 7,000 tickets were sold this year. While final figures are still being tabulated, the event usually raises between $25,000 to $50,000, he said. Over the 24 years Strike Out Hunger night has been in existence, $640,000 has been contributed, mostly to PolioPlus, he said. In addition, all ticket holders for the night's game are invited to bring nonperishable canned items for a local food bank. A different food bank contracts each year to cart away the tons of donated items. This year's collection went to the South Jersey Food Bank in Pennsauken, New Jersey. "The event is really a win-win for everyone involved," said Axler. "We have a marvelous relationship with the Phillies. Neal's dream was really to clone this event and take it throughout the country wherever professional sports are played."